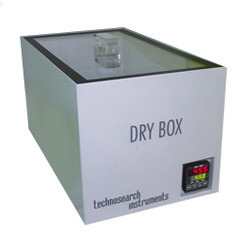 Prominent & Leading Manufacturer from Thane, we offer dry box with pid controller. With our rich industry experience in this domain we are dedicatedly engaged in offering Dry Box. The provided dry box is carefully manufactured by our skillful workforce using well tested components and progressive technology keeping in mind the set norms of industry. Also, this dry box undergoes several tests by our quality auditors in order to deliver a defect free range. Usable Volume: 450 x 250 x 150 mm.